In an unprecedented poll, the British Society of Magazine Editors (BSME) has canvassed its members to name the most influential magazine of all time. And the winner is ... Time, the American news weekly. For several weeks, editors have been making their choice of "the most influential magazine, past or present, dead or alive, published in the English language". The nominations ranged from Life magazine to Loaded and from the Architectural Review to the comic Elektra – Assassin. The early front-runners were Jackie, the girls' weekly which closed in 1994, and Smash Hits, the pop fortnightly which closed in 2006. Time, the world's biggest-selling news magazine with a circulation of 3m, was nominated by James Waldron, editor of Chemist and Druggist and winner of the BSME's Fiona Macpherson New Editor award for 2018. "Time's covers are so iconic," Waldron said, "that they are still used as shorthand to pinpoint key moments in history. You don't get much more influential than that." Leading editors, past and present, argued for their choices at a special BSME event held last night at the new Bankside Hotel in Southwark. Ian Birch, former editor of TV Guide and author of Uncovered, an oral history of great front covers, spoke up for New York magazine under its present editor Adam Moss, homing in on the cover Cosby: The Women, photographed by Amanda Demme. "This was in 2015," Birch said, "but it anticipated the whole #MeToo era. It prompted the hashtag #TheEmptyChair and inspired ten more women to come forward with their stories, showing the impact a single image can have." Melissa Denes, editor of Guardian Weekend, argued for Vogue, particularly in the late Eighties and early Nineties, when it was edited by the late Liz Tilberis. "Vogue is highly influential," she said. "It's the cover everybody wants to be on, from Rihanna to Kate Middleton, and under Liz Tilberis, especially, it was a club that drew the reader in. Full of fun, visual experiment, and driven by the energy and charisma of the original supermodels. It has spawned movies, documentaries, and a hundred other fashion magazines. Vogue is a truly global brand, and yet each edition, British, American, French or Italian, has its own character." Terri White, editor-in-chief of Empire and Pilot TV, chose Time, now edited by Edward Felsenthal. 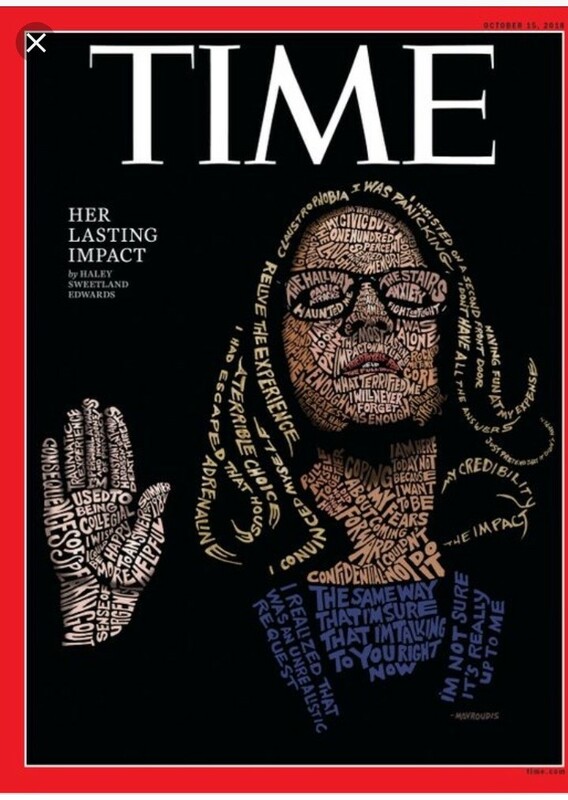 She singled out a cover from this month, showing Dr Christine Blasey Ford giving evidence to the senate about Judge Brett Kavanaugh, in an illustration by the artist John Mavroudis which made use of Ford's own words. "That cover moved me to tears when I first saw it," Terri White said, "It will go down in history as an iconic image. Time, which was America's first news weekly when it launched in 1923, still has this amazing ability, even in the digital era, to find its own perspective on a story that has already been everywhere. The double whammy of Brexit and Trump has made the news weeklies more relevant than ever, and Time leads the pack. It has a specific lens, a smart take, on the issues facing the world right now, and its covers, reporting and insight are hugely impactful – not just on its audience, but on other news media and the world at large. It moves beyond the pages of the mag to protest marches, onto placards and over the walls of the White House itself. Anyone who wonders how magazines can still be relevant in 2018 just needs to look at a printed copy of Time, and feel its power." The BSME event culminated in a live vote with eight magazines on the ballot. Time emerged as the clear winner, with Vogue in joint second place alongside Nova, the innovative British monthly that ran from 1965 to 1975. Fourth was Smash Hits, just ahead of New York, with NME (in the mid-Seventies), Just Seventeen and Jackie completing the shortlist. The event was devised and chaired by Tim de Lisle, the former editor of Intelligent Life. "The evening produced a worthy winner in Time," he said, "and made for an eye-opening discussion, which ranged from whether the lads' mags of the Nineties were reprehensible to whether today's editors are right to allow stars like Beyonce and Taylor Swift to appear on their cover without giving an interview. What was most striking was the way that magazines that have long since closed down, like Smash Hits and Jackie, live on as influences on today's editors, who grew up loving them. You can take a magazine off the shelves, but you can't take it out of the hearts and minds of its readers."